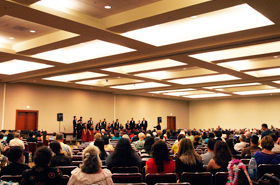 The Hawaii Music Festivals was held at the 17th Annual Honolulu Festival. It consisted of 3 festivals which are Hawaii Choral Festival, Hawaii Band & Orchestra Festival and Hawaii Cheer & Dance Festival. Also, schools from the U.S. mainland, Hawaii, Canada and Japan participated. 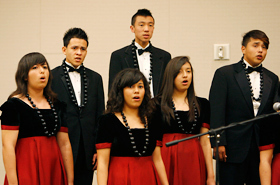 They are the members of A Capella Choir from El Monte High School. The audience was quietly mesmerized while listening to the choir with a sense of tranquility. 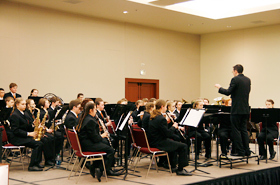 Many of the participating bands experienced other festivals and concerts including overseas. Their heavy sound of brass instruments was gorgeous and melodious at the same time. 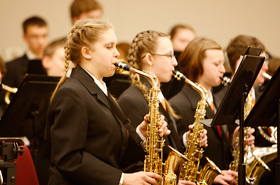 They are the members of the Sr. Concert Band from Spectrum Community School in Canada. The brass band has its own attraction which is different from the orchestra band. There were loud cheers at the Hawaii Cheer & Dance Festival, which was different from the calmness of the other festivals. The audience gave a loud round of applause every time the presenting team successfully demonstrates their acrobatic skills. They were various techniques such as tossing, lifting and tumbling which were performed by the young and college cheerleading teams. In addition, it is true that the college cheerleaders were more experienced compared to the young team which excited the show. The audience gave loud cheers to the young ones as well. Those loud cheers were just as passionate as the voice of the cheerleaders, which felt like the wall was about to be blown off! There was a competition of which team can maintain balance for a long time. The loud cheers echoed throughout the venue. 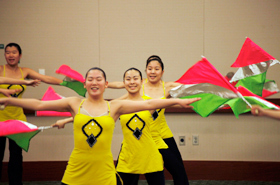 The Baton Twirling Club of Sanyo Girls’ Junior and Senior High School performed freely in a groove.